The SET Project (Sustainable Emission Test) has been presented on the September 22nd, 2015. 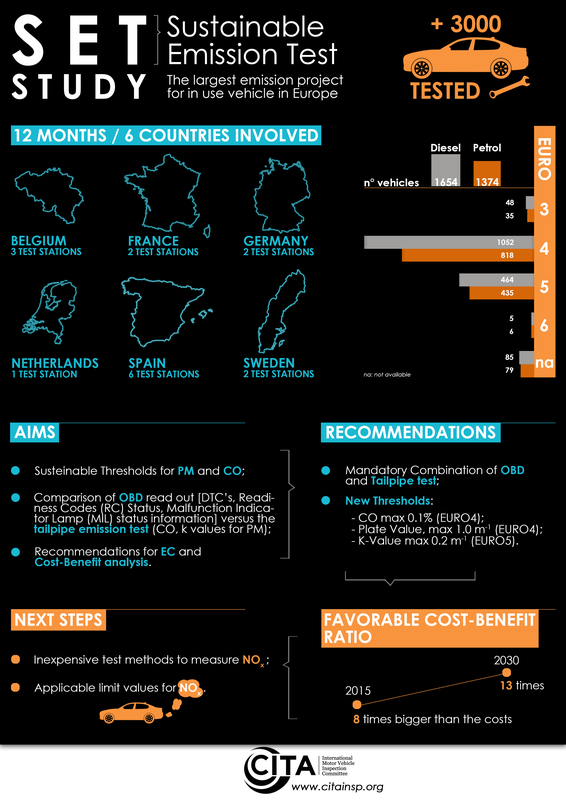 Vehicle manufacturers and suppliers are making big efforts to produce cleaner vehicles both to give an answer to the requirements of society and to fulfil approval standards. In the interest of environmental and health protection as well as fair competition it is important to ensure that vehicles on European roads are maintained to a high degree of technical roadworthiness, taking into account the standards the vehicle was designed to meet, the latest developments in vehicle and measurement technology, and the need for economically viable solutions. 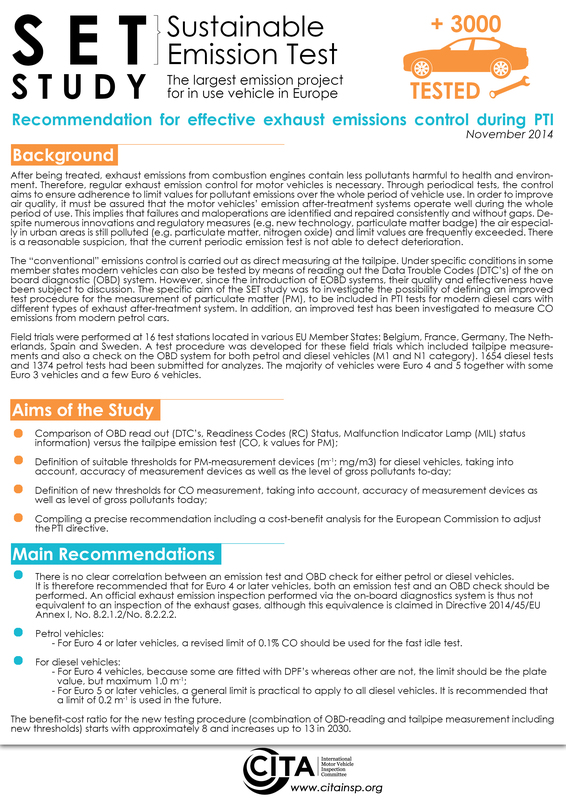 For modern-technology vehicles and engines with on-board diagnostic (OBD), and after-treatment systems such as exhaust gas recirculation (EGR), diesel particulate filters (DPFs), selective catalytic reduction (SCR), etc., there is a need to review the regulations which apply to the Periodic Technical Inspection (PTI). In order to ensure that the negative impact on the environment and health is as low as possible and to improve air quality sustainably, it is crucial to keep the benefit of the new vehicles’ design during their whole life. This means that malfunctions of the emission system has to be detected during the periodic emission test and eliminated immediately. 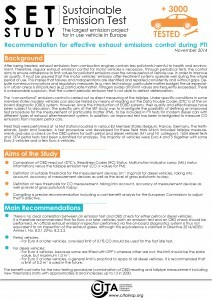 CITA has undertaken the SET Project with the aim of assessing available approaches of in-use vehicle testing and to adapt vehicle inspection techniques to new and stricter pollutant emission thresholds. The data retrieved have been analysed in order to compare OBD read out (fault codes, RC Status, status information) versus the tailpipe emission test (CO, k values for PM); to define suitable thresholds for PM-measurement devices (m-1; mg/m3) for diesel vehicles, taking into account, accuracy of measurement devices as well as the level of gross pollutants today; to define new thresholds for CO measurement, taking into account, accuracy of measurement devices as well as level of gross pollutants today and to finally compile a precise recommendation including a cost-benefit analysis. 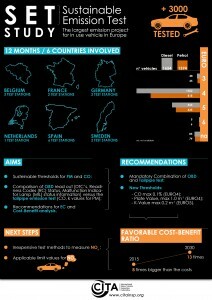 Enhancing the periodical inspection of pollutant emissions in Europe as defined in the project has a benefit between 7 and 12 times higher than the cost.